We’re getting a new Doom game. My personal excitement aside – and there’s a lot of it so let’s all just do our best to ignore it festering in the corner there – it being 2016 means we’re getting more access to it than we would have back in 1993. 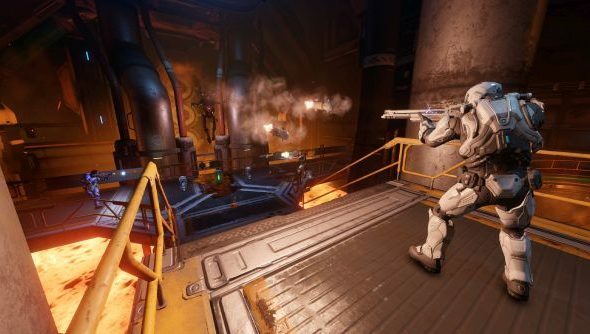 The Doom Open Beta starts this Friday, April 15, following up on the heavily NDA’d Alpha in 2015 and the Closed Beta that ran for pre-orderers a few weeks back. Here’s everything you might want to know about it. Just want a shooter to play? Here’s the best FPS games ever playable with keyboard and mouse. When is the Doom open beta? How do I get the Doom open beta? Thankfully, it being open, there’s no special requirements. It’s being distributed via Steam, so if you’ve been avoiding getting a Steam account all this time then sorry about that. You can head over to the store page and select play game to start pre-loading right now. If you get it downloaded and try to start it up before the live-time, it just won’t boot. If you were in the closed beta or alpha and haven’t yet deleted the download, it’s the same set of files and should be marked as open beta in your library now. What’s in the Doom open beta? Two modes: Team Deathmatch and Warpath. I’ll assume you understand the former, while the latter is a sort of moving king of the hill mode, where a large zone moves around the map and must be captured and held until a point threshold is met. Both are 6v6. Two maps: Heatwave and Infernal. One is a lava-fueled UAC facility, while the other is in the depths of hell. Both have a full complement of power-ups, weapons and items to experiment with. Eight weapons. I’d recommend trying a combo of the Rocket Launcher and Super Shotgun, utilising weapon switching to fire each in quick succession. Should two-shot anyone not roided up with health and armour. A variety of hack modules and cosmetics. These drop randomly after each game. Hack modules are most similar to Titanfall’s burn cards, but they persist through death on a timer and aren’t quite as powerful. The Revenant. Just the one demon to turn into, while the final game will have four. You’ll want to do this a lot, as it’s ludicrously overpowered. This is identical to what was in the closed beta. Whether the build will be different in balance, or if maps have been rebalanced, or if there will be more to discover, hasn’t been confirmed. Have a read of Jeremy’s Doom beta impressions for more opinions on it. Did we miss anything? Let us know your tips for the Doom open beta below, and we hope to be ripping you limb from limb in the near future.